Princess Diana was "The People's Princess," beloved by the whole world -- and even A-list stars were susceptible to her charms. Floored by her grace, sense of humor and megawatt smile, she made a major impact even on people she only spoke with a few times, like Tom Hanks and Rita Wilson, who attended her 1997 funeral. 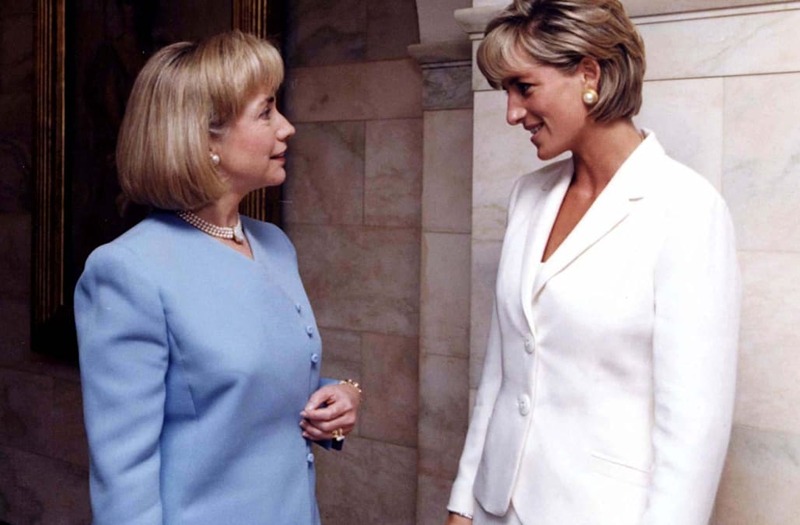 Hillary Clinton: Just weeks before her death, Princess Diana traveled to Washington, DC in support of the Red Cross. She met with the First Lady at the White House, where photographers snapped a lovely image of the two women looking almost like sisters: Beyond their blonde bangs and neck-length haircuts, they're both wearing large pearl earrings and feminine fitted suits. Upon hearing of the princess' death, Bill told press he and his wife were "profoundly saddened": "Hillary and I knew Princess Diana and we were very fond of her," he said. Hillary attended Diana's funeral by personal request of the royal family and Diana's own, who "sent a fairly strong signal that they believed that the First Lady was the best person to represent the President, the United States, and the American people," a White House official told the New York Times. Steven Spielberg: Spielberg was graced Diana's presence during several important nights in his own career: He chatted with Diana at the international premieres of two of his biggest films, "Jurassic Park" and "Back to the Future," and he was present during a private screening of "ET" hosted for her and Prince Charles -- but things went a bit awry. When the movie ended, Spielberg and the other guests were quickly ushered away from the royals. Why? Because Diana had wept so much that her makeup was running all down her face. After she was properly fixed up, she requested to meet with Spielberg, presumably to compliment the movie. Nicole Kidman and Tom Cruise: Some were surprised to see Kidman and Cruise at Princess Diana's funeral, but close followers of the celebrity couple knew that they'd met Diana years before. The three spoke at a London screening of their film "Far and Away" in 1992. The celebrity couple was "devastated" upon hearing of the accident, Cruise told CNN during an appearance days after Diana's death. He shared that Kidman had previously been stalked by paparazzi in the same tunnel where the fatal car crash occurred: "They run lights and they chase you and harass you. It happens all over the world, and it has certainly gotten worse." John Travolta: His years in the spotlight have allowed for countless incredible experiences, but there's one memory he cherishes above almost all others: "I danced with Princess Diana in 1986, I believe," he told "Good Morning America" in 2016. "That was one of the highlights of my life." Years earlier, he described the experience on Dutch TV network Één. "I didn't know or expect to dance with Princess Diana, and it was the president's wife, Nancy Reagan, that said, 'It is her wish.' At midnight, I had to tap her on her shoulder, and I had to say, 'Would you care to dance.' She turned around and dipped her head in that Lady Diana way and we were off for 15 minutes dancing. I'll never forget it," Travolta said. Photos of the dance show John and Diana twirling away on the dance floor as President Reagan and Nancy Reagan look on. "I'm so honored that I was able to experience it, and I know for a fact that it was a highlight of being in the United States; it was her favorite moment," he continued. "So I feel I made her life better; she made my life better; and I'm very sorry that she's not here." George Michael: The Wham! frontman arrived at Princess Diana's funeral alongside Elton John, who would soon perform "Candle in the Wind" for his late friend. Michael struggled to hold himself together during the emotional service, he has since said. "I bawled my eyes out," he said a few months later, in November 1997, adding that he adored Diana. "I met her maybe a dozen times and I always had a laugh with her, and I really admired her. I thought she was so great not to be consumed by everything that had happened to her and to keep giving and giving. I thought she was a really great person -- the Elvis of compassion." He continued, "I think she was there to remind people of their humanity. And who but the most famous person in the world could do that? Look at what it did to people when she died. It was like losing a mate that you didn't know you cared that much about until they died. People felt like they had lost a bit of humanity. It felt very raw." Elton John: Since the world wasn't yet privy to texting or emails, the icon only learned of Diana's unexpected death when a friend sent a fax offering condolences the next morning. After agreeing to perform at her funeral, he worried he would start crying in front of the massive audience: "What was going through my mind was, 'Don't sing a wrong note. Be stoic. Don't break down and just do it to the best you can possibly do it without showing any emotion whatsover,'" he said in 2008. Just weeks before Diana's own funeral, she comforted John at the funeral of Italian designer Gianni Versace, who had been murdered in Miami. John adored Princess Diana, but in the years since her death, he has indicated that he thinks she chose her inner circle poorly. "In the end with Diana, she trusted the wrong people. She didn't trust the people she should have trusted: Her true friends," he said during a VH1 interview. "I always felt the people that really felt for her and really were true to her, she just was a bit airy-fairy towards in the end." Bryan Adams had a brief fling with Diana just over a decade after he made a 1985 song about her titled "Diana." In the hit, he calls her the "queen of all my dreams." At the time, Adams was dating Cecilie Thomsen, who confirmed the affair, and his rendezvous with the princess led to their breakup. Hasnat Khan, who Princess Di called "Mr. Wonderful," was considered to be the love of her life. They kept their two-year relationship under wraps because he was scared about all the attention it would receive in the media. However, the pressures of dating a royal proved to be too much for the Pakistani heart surgeon as he broke things off during a meeting at a park. Oliver Hoare, who was 16 years older than Diana, was a close friend of Princes Charles. Oliver and Charles became close in 1992 after the death of her father. Sources claimed the princess was "obsessed" with him, and part of his appeal stemmed from the fact that he was her husband's friend. Details of their sexual relationship are unclear, but a source close to Diana once revealed that he found Hoare "semi-naked behind a potted bay tree in a Kensington Palace corridor, smoking a cigar." Diana's alleged relationship with bodyguard Barry Mannakee was one of her earliest marital affairs. Mannakee, who was also married at the time, worked at Kensington Palace for about a year, until he was spied "comforting" a depressed Diana. He was removed of his duties in 1986. He died in a motorcycle crash in 1987, and his death has been the subject of many conspiracy theories. James Gilbey, a car salesman at the time of his alleged affair with Diana, was caught on tape having intimate phone conversations with the princess. Gilbey once called her "Squidgy" as a pet name in 1989, sparking media firestorm. James had known Diana for years, but it wasn't until her marriage began crumbling that she saw him as more of a friend. In the summer of 1997, Dodi Fayed became romantically involved with Diana. Just a couple of weeks before their relationship began, he got engaged to American model Kelly Fisher. He ultimately called off his engagement. Dodi and Diana both died in the fatal August 1997 car crash after having spent nine days together on holiday aboard his family's yacht. Princess Diana herself had confessed to having an affair with James Hewitt, her former horseback riding instructor whom she met back in 1986. Hewitt recently denied that he's Prince Harry's father, a rumor that has been following him for years. He also once attempted to sell Diana’s letters to him for 10 million pounds years after her death. Prince Charles and Princess Diana had the ultimate fairytale wedding at St. Paul's Cathedral in 1981 -- but that magic was short lived. After the birth of their two sons, William and Harry, they reportedly were involved in affairs of their own and split in 1993. Their divorce was finalized in 1996.